Taylor-Jensen Fine Arts is pleased to show the artwork of the art teachers in the Manawatu region. 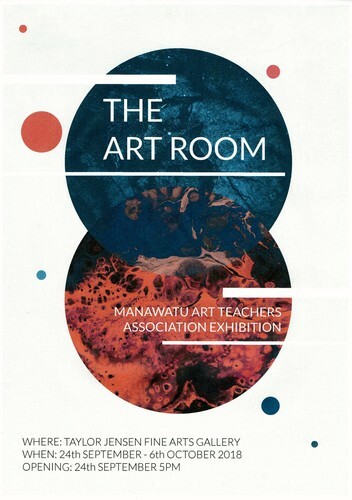 The MATA (Manawatu Art Teachers Association) exhibition is a showcase of our Manawatu Art Teachers and their personal artworks which are guided by each of their creative strengths. There are various mediums in the exhibition which include printmaking, painting, mixed media, glass and digital works. The biannual exhibition gives teachers the permission to explore and indulge in their own creative realm where usually that time would be spent helping, assisting and inspiring their students in the classroom. It's an opportunity to show off their skills and celebrate what they do and why they do it, which is to continue to inspire the younger generations. This is the third exhibition for the organisation. The biannual exhibition in 2018 demonstrates a diversity of creative talent, with painting, glass, photographic and digital works. Many of the same artists are exhibiting again this year. There are also a few new faces, reflecting the constant gradual change of staff. “The Art Room” in any school is a special place with a unique feel. It often sits outside the normal boundaries of school rules and codes of behaviour. There is a loosening of thought and practice, it can be a place where you feel accepted for what you are yet challenged to become something else. The art teacher’s role is pivotal in creating that environment because without it the arts would not flourish. Creativity necessitates commitment, time and hard work. Teachers need to instil these values in their students yet also apply them to their own practice. This really is practicing what they preach. - Mixed Media - Donna Manley (PNGHS) and David Taylor (FAHS). - Photography - Verity Elder (Freyberg), Melissa Renner (PNGHS), Kayla Kaandorp (PNBHS) and Charlene Purcell (Cornerstone). - Painting - Jane Moss (St Peters), Dennis Pierce (FAHS), Sophie Bain (LAC), Juliana Paul (LAC) and David Taylor (FAHS). Many of these works will be available for purchase and at least one artist will have prints of her paintings available for purchase. A visit to the gallery may provide parents and grandparents with a better understanding of the work their children and grandchildren have brought home to have framed or to adorn their rooms. This exhibition might also provide an insight into the quality of teaching that has led students to produce award-winning work especially for year-end portfolios.